Solid entry level gaming keyboard. Though it lacks true mechanical switches, it boasts a feature set that includes dedicated media buttons, customizable macro keys, and a programmable LED backlight. Despite lacking mechanical switches, this is still a solidly constructed, responsive keyboard that feels built to last. The Wrist rest, however, feels cheap and superfluous. A sleek, non-ostentatious design with an attractive, vibrant full-color backlight. Pulsing light effects lack the fidelity of some higher-end keyboards, but that’s a minor quibble. 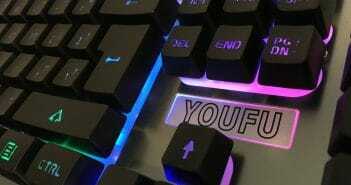 Macro keys and lighting effects are customizable directly through the keyboard and don’t require external software. Anti-ghosting features work consistently as advertised. 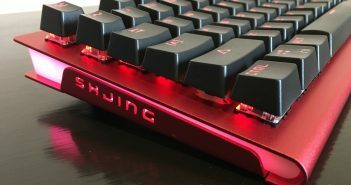 Although less expensive than a true high-end gaming keyboard, it is still a little bit pricey for what’s ultimately just a small handful of premium features. These are the four tangible things you’re actually paying a premium for (in addition to the intangible status symbol of owning a keyboard that says “gaming” on the box) when buying a gaming keyboard, and it’s the only real rubric we have for determining whether or not they’re worth the premium price. So, with that in mind, let’s take a look at the Corsair K55 RGB. At roughly $50, the Corsair K55 RGB runs on the less expensive end of the spectrum for gaming keyboards, but is still two-or-three-times more expensive than your basic keyboard and mouse combo. But is it worth it? Let’s check it against our rubrics to find out. First thing’s first, let’s address the biggest functional differentiator between standard and gaming keyboards. The Corsair K55 RBG does not have mechanical switches. Instead, it has rubber dome membrane switches, just like any other run-of-the-mill keyboard. Speaking personally, I don’t mind the membrane switches. The click of a mechanical switch is tactilely satisfying in a way that regular membrane switches are not, but I’m not sure I’ve ever noticed any actual performance differences between mechanical and membrane switches. It certainly feels nicer to type on mechanical switches, but I’d hardly call it an essential feature. And for a membrane keyboard, the Corsair K55 feels well-constructed. The keypresses are solid and responsive, and the keys themselves are comfortable and sturdy. The longer keys like the spacebar are also reinforced with a metal rod to prevent any excess wobble. The packaging boasts that it has, “Quiet and responsive keys,” and to my testing, both of those things prove to be accurate. It’s just that your mileage may vary as to whether the quiet is more valuable than the tactile click of a mechanical keyboard. 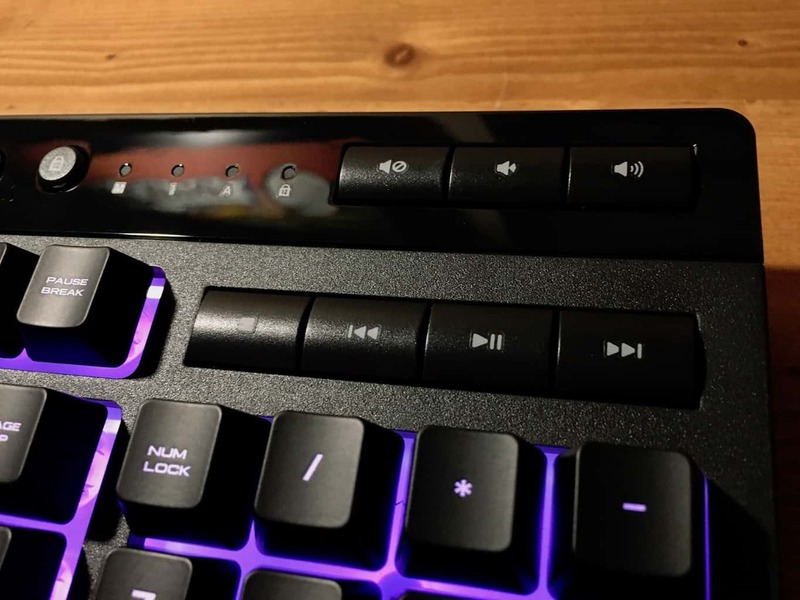 The keyboard also has dedicated buttons for media playback – mute, volume up, volume down, play/pause, stop, skip forward, skip backwards – as a well as buttons controlling the keyboard backlight, locking the Windows key, and recording custom keystrokes to assign to the macro keys. Having these as separate, dedicated buttons rather than combining them with the function keys is a nice touch, but again, perhaps not something that is essential. To my mind, this is the one category on our gaming keyboard that pretty clearly does present an advantage for players using a gaming keyboard. The ability to map complicated keystrokes to a single button in things like fighting games is such an obvious asset that some might even consider it unfair, but hey, don’t let me stop you. 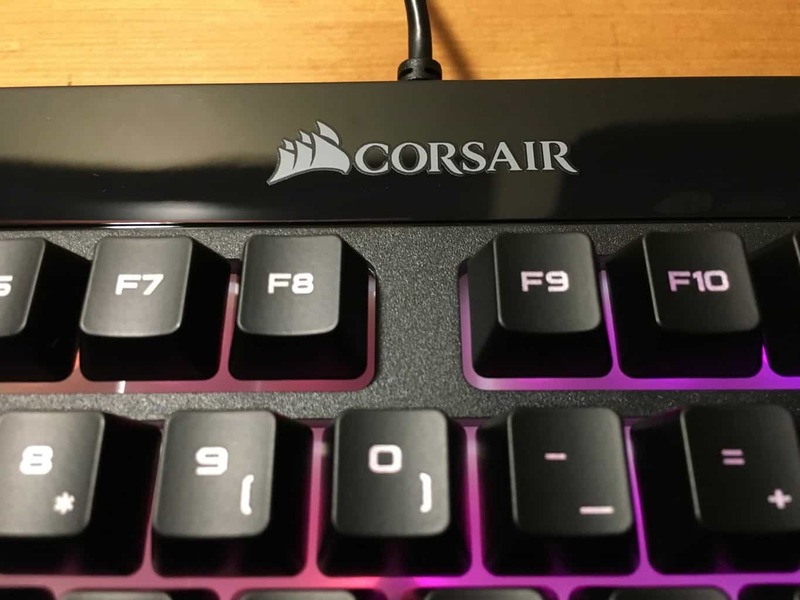 Unlike mechanical switches, this is a defining feature that the Corsair K55 RGB actually does have. Off to the left side of the keyboard there’s a vertical column of six ‘G’ keys, each of which can be assigned a different set of keystrokes. Even niftier, you don’t have to install any software in order to map these macro keys, instead the software is built into the keyboard’s internal memory. All you have to do is press the ‘MR’ button to start recording keystrokes, then press it again to save the sequence once you’ve finished. 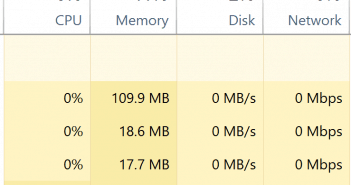 You can clear macros the same way by holding down the macro key for three seconds. I tested assigning several different key sequences to the macros and it works just like you would expect. 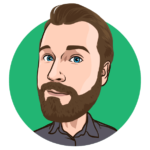 “Anti-ghosting” is one of those pieces of marketing jargon that can often be misleading. Ostensibly it’s a feature that prevents keystrokes from being lost when multiple keys are pressed simultaneously, but it’s not uncommon for manufacturers to include this as a bullet point on the box when in actual practice the results are less than consistent. 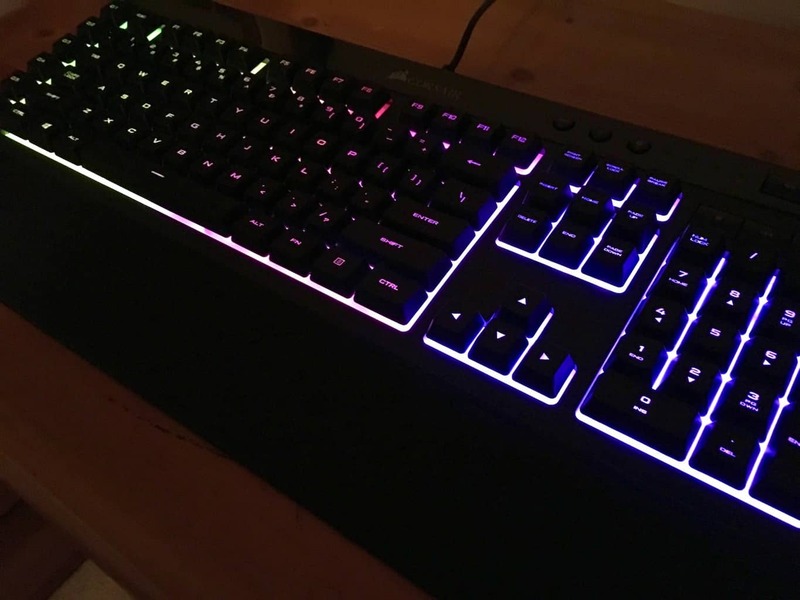 Fortunately, from my testing, the Corsair K55 RGB actually does what it says on the tin. 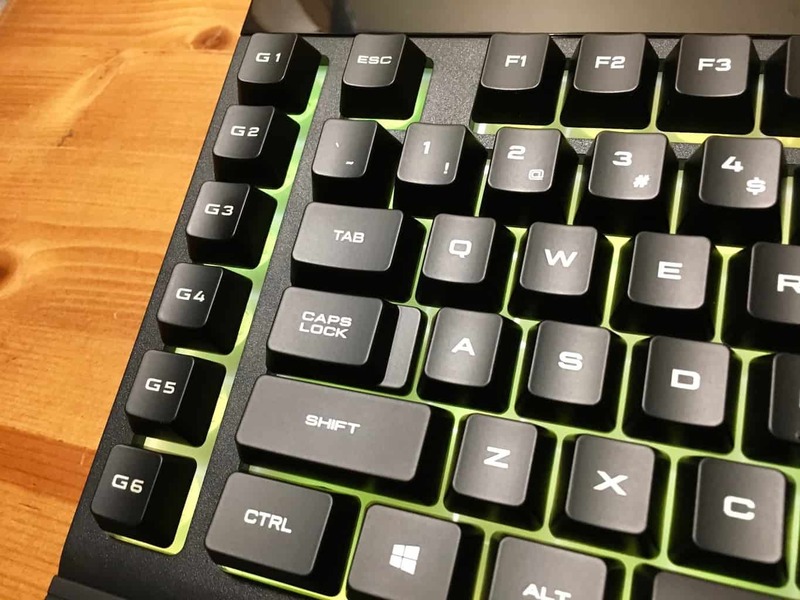 The packaging claims anti-ghosting for up to eight keys, and testing at multiple points on the keyboard proved this to be true – and consistently so. Again, this is something that could actually make a difference while playing games, although in reality it’s unlikely that you’ll encounter a game that will demand you to press eight keys simultaneously. 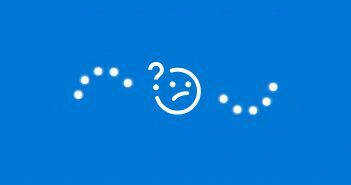 Still, it’s nice to have the comfort of knowing you’ll probably never run into ghosting problems than to have one of your inputs lost at the most inopportune moment. From my experience, this seems to be the primary thing that differentiates gaming keyboards from everything else, and it also happens to be the thing that is most superfluous. 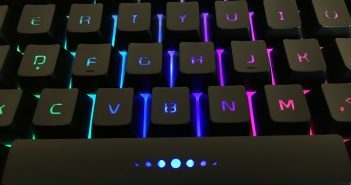 The way your keyboard looks isn’t going to have any bearing over how well you play, but if you’re shelling out for an expensive gaming rig, it’s perhaps nice to have an aesthetic pleasing keyboard to complement it. 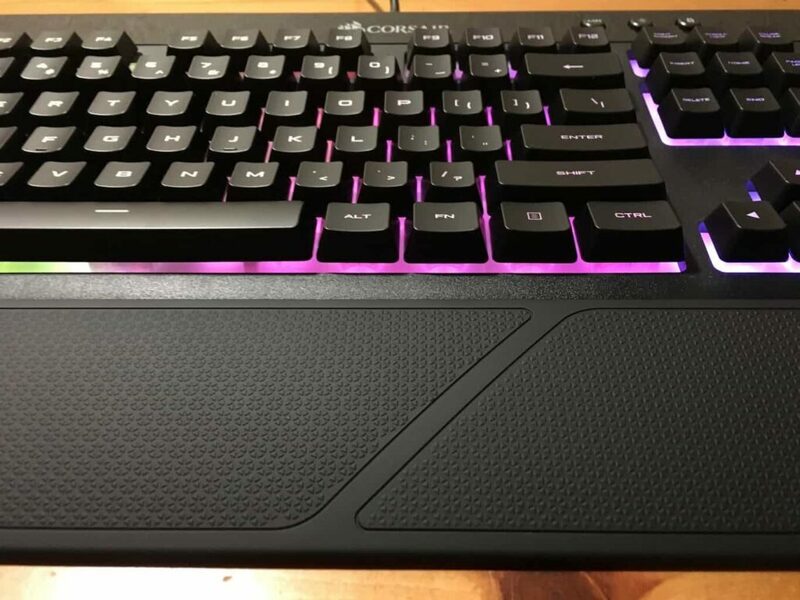 Either way, the Corsair K55 RGB is a nice looking keyboard that lacks a lot of the ostentatious (read: ugly) design touches of other gaming keyboards, which is probably for the better. Its shape is a standard rectangular design with keys laid out in the standard arrangement. The majority of the surface is a matte black finish, but the top is finished in a glossy, reflective black that adds a nice bit of contrast to the design. The bottom of the keyboard has four rubber pads to prevent it from sliding or scratching, as well as a pair of retractable feet to elevate the back of the keyboard for more comfortable typing. Also, to aid in comfort, the keyboard comes with a detachable wrist wrest. The rest attaches via plastic clips rather than magnets, but the clips feel slightly flimsy and could be prone to breaking if taken on and off excessively. In fact, the wrist rest is the one part of the entire package that feels of noticeably lower quality than the rest. You’re probably better off just leaving it in the box and buying a proper padded wrist rest separately. But the main aesthetic flourish, and the main thing that makes this look like a gaming keyboard is the titular RGB backlight. And to its credit, it is striking. As soon as you plug it in, the backlight starts pulsing with a rainbow pattern. From there, you can choose one of seven preset color profiles, or program your own directly in the keyboard (once again, no separate software is required). If one were inclined to get nitpicky, one could point out that other gaming keyboards have similar rainbow patterns with a greater deal of color variance and more fluid movement in the cycling patterns, but one could also point out that those keyboards are substantially more expensive and you’re probably going to switch to a static color profile anyway since it’s less distracting. If you’re looking for a gaming keyboard to complete your set up, but you’re hesitant to shell out $100+ on a top-of-the-line mechanical keyboard, the Corsair K55 RGB isn’t a bad entry level keyboard. It’s still a little bit pricey for something that is not functionally that different from a standard issue $15 keyboard and mouse combo, but the added features of customizable macro keys and genuine anti-ghosting might be enough to justify the $50 price tag. Still, the Corsair K55 RGB is a solidly made, slick looking keyboard with a handful of premium features. The ability to customize it without using any external software makes it simple and intuitive to use, and the macro keys might genuinely give you that little bit of edge when you need it. There are certainly worse ways to spend $50. can you suggest me the best gaming keyboard for me?